As explained in detail in the companion article to this one, the Book of Mormon presents itself as an historical narrative concerning two successive civilizations in the Americas stretching back more than two thousand years before Christ. The first of these civilizations was established by the Jaredites, people from the Middle East who left at the confusion of languages at Babel and sailed across an ocean to become the first humans to inhabit the Americas. After the Jaredites died out through warring among themselves, a second wave of migrations across the ocean to the Americas from the Middle East, by two groups of Israelites fleeing due to the Babylonian Conquest, initiated a second civilization that lasted from the sixth century BC to the early fifth century AD. The survivors of the war that ended that civilization, called the Lamanites, remained as the sole inhabitants of the land. Thus, the Book of Mormon claims that the Americas were inhabited exclusively, or at least primarily, by people of Middle Eastern origin from before 2000 BC until the Europeans arrived in the late fifteenth and early sixteenth centuries AD. The purported historical narrative of the Book of Mormon presents an account of the origins of Native American peoples that differs dramatically from the consensus position taken by scientists, including geneticists (who study DNA). The scientific consensus is that the Americas were first populated roughly 15,000 years ago by people from Siberia who in their natural migration patterns as hunters and gatherers had gradually made their way to Beringia (a land bridge where the Bering Strait is now located) and eventually crossed over into Alaska and from there spread southward throughout the Western Hemisphere. All modern Native Americans throughout North, Central, and South America are descended from those Asian people who came into the Western Hemisphere, probably in multiple waves of migration. Their DNA—their genetic makeup—is East Asian or Siberian, not Middle Eastern. Thus, DNA research leads to conclusions about who the ancestors of Native Americans were, when they arrived in the Americas, where they entered the Western Hemisphere, and why they went there, that all disagree with what the Book of Mormon says on those points. Based on the Book of Mormon and Joseph Smith’s own teaching, the traditional view of the LDS Church has been that the Lamanites encompass all of the Native American peoples of the Western Hemisphere. This view necessarily entails that Native Americans are predominantly Middle Eastern in origin. However, the evidence of modern genetics shows that Native Americans have no significant genetic links to any Middle Eastern peoples. The problem is compounded further because the Jaredites, whom the Book of Mormon says occupied the same lands prior to the arrival of the Lehites and Mulekites, were also supposed to have been of Middle Eastern origin. The consistent finding of modern genetic study that all Native American peoples descended from Siberian or East Asian ancestors who came into the hemisphere through Alaska millennia before the Jaredites would have existed thus poses an extremely serious scientific problem for the historical validity of the Book of Mormon. In the rest of this article, we will comment on specific statements in the LDS.org essay “Book of Mormon and DNA Studies” pertaining to what it says about the science of DNA research as it applies to the issues raised by the Book of Mormon. Quotations from the essay will appear as separate paragraphs in italics, followed by a response. Some have contended that the migrations mentioned in the Book of Mormon did not occur because the majority of DNA identified to date in modern native peoples most closely resembles that of eastern Asian populations. This statement is misleading in at least three ways. (1) It suggests that it is only a “majority” of the DNA samples that have been studied that support an East Asian (more specifically Siberian) origin of Native American peoples. In fact, the consensus of DNA studies support this conclusion. (2) It implies that the DNA studies that pose a problem for the Book of Mormon have been done only on “modern native peoples” whereas in fact such studies have also been done on the fossilized remains of ancient individuals in both North and South America. (3) By saying that this is the situation “to date” the essay intimates that there is some hope and even some reason to think that future studies may find evidence of Middle Eastern peoples migrating to the ancient Americas. This intimation is misleading because, as shall be explained as we proceed, the science is well enough developed and the data is extensive enough that one can now reasonably conclude that such evidence is not going to turn up. More generally, the essay implies that the problem is simply a lack of genetic evidence, so far, corroborating the Book of Mormon. If the problem were merely a lack of evidence, one could legitimately argue that a lack of evidence is not refutation (“absence of evidence is not evidence of absence”). This is a running theme not only throughout the LDS.org essay on DNA but throughout defenses of the historicity of the Book of Mormon. The real problem is the massive evidence concerning the origins of the native peoples who lived throughout the Western Hemisphere prior to the arrival of the Europeans just over 500 years ago. The conclusions of genetics, like those of any science, are tentative, and much work remains to be done to fully understand the origins of the native populations of the Americas. This is one of many statements in the essay regarding science that without a context is true enough but that is completely inapplicable in the context of the problem the essay is meant to address. Scientists do attach some measure of tentativeness to their conclusions, but they are not tentative about everything, nor should they be. Where scientists find themselves in widespread agreement on matters that have been addressed in numerous, independent scientific studies, they have reason to be far more confident than on matters about which the scientific literature is divided or even in chaos. There is indeed much work still to be done, much research that is still ongoing, in the study of the origins of Native American peoples. Nevertheless, some things are fairly well understood. Some things are known. The essay engages in some fine wordsmithing to obscure the difference between conclusions that are very well established scientifically and conclusions that remain debatable and even highly controversial. Consider the case of Dr. Ugo A. Perego, a Latter-day Saint population geneticist. His genealogy confirms that he is a multigeneration Italian, but the DNA of his paternal genetic lineage is from a branch of the Asian/Native American haplogroup C. This likely means that, somewhere along the line, a migratory event from Asia to Europe led to the introduction of DNA atypical of Perego’s place of origin. If Perego and his family were to colonize an isolated landmass, future geneticists conducting a study of his descendants’ Y chromosomes might conclude that the original settlers of that landmass were from Asia rather than Italy. This hypothetical story shows that conclusions about the genetics of a population must be informed by a clear understanding of the DNA of the population’s founders. In the case of the Book of Mormon, clear information of that kind is unavailable. This argument, which Perego himself had advanced in an earlier article,2 assumes that the only type of study that might be done on his genetic heritage would be a study of his paternal lineage. Again, geneticists including Perego himself are able to study the maternal lineage and the paternal lineage of individuals, which makes it possible to correct for any anomalous features of the genetic history of an individual. Ironically, Perego gave his analogy of his own paternal genetic lineage in an article about the Book of Mormon and the origins of Native Americans in the light of maternal genetic information. If the Peregos “were to colonize an isolated landmass,” a complete study of their descendants’ genetic information using all of the available types of tests would likely reveal both their European origins and their Asian genetic background. At the present time, scientific consensus holds that the vast majority of Native Americans belong to sub-branches of the Y-chromosome haplogroups C and Q and the mitochondrial DNA haplogroups A, B, C, D, and X, all of which are predominantly East Asian. But the picture is not entirely clear. Continuing studies provide new insights, and some challenge previous conclusions. For example, a 2013 study states that as much as one-third of Native American DNA originated anciently in Europe or West Asia and was likely introduced into the gene pool before the earliest migration to the Americas. This study paints a more complex picture than is suggested by the prevailing opinion that all Native American DNA is essentially East Asian. The point of the above passage from the LDS.org essay is less than clear. One possible implication that Mormons might take away from it is that the 2013 study offers some support for the Book of Mormon’s claim that the Jaredites (from the Middle East, which might be included in West Asia) were at least among the original inhabitants of the ancient Americas. More generally, the impression is given that the study reveals the inability of scientists to reach any definite conclusions that might impact the historical authenticity of the Book of Mormon. Both takeaways from the 2013 study would be erroneous. 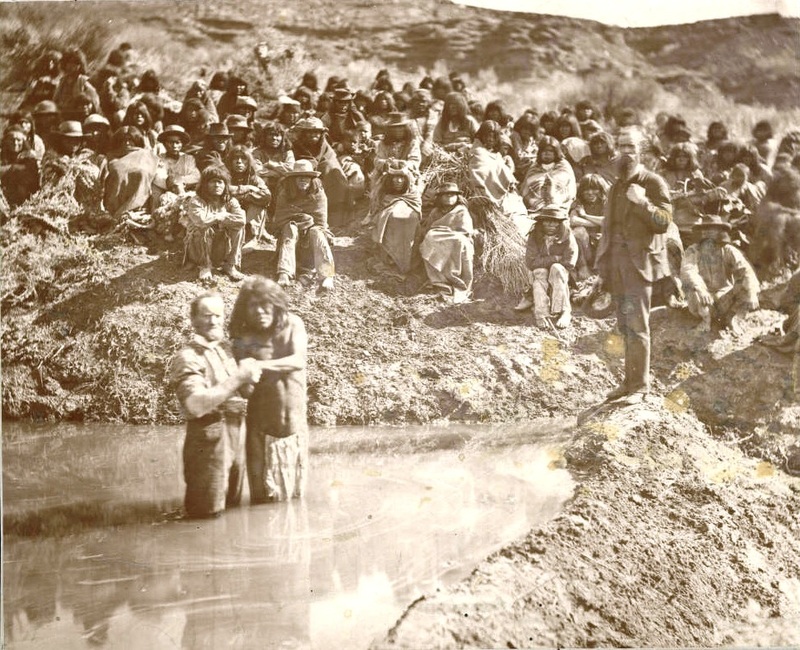 The 2013 study changes nothing of relevance to the Book of Mormon or to the DNA problem with the claim that Israelites were significant ancestors of the Native American peoples. Human occupation of the Americas began thousands of years before the Jaredites would have existed. Essentially all of the Native American peoples of both North and South America are descendants of people who migrated into the Americas from Siberia through Alaska. The ancestors of Native American peoples did not include millions of Israelites living in the Western Hemisphere a millennium before Columbus. While Near Eastern DNA markers do exist in the DNA of modern native populations, it is difficult to determine whether they are the result of migrations that predated Columbus, such as those described in the Book of Mormon, or whether they stem from genetic mixing that occurred after the European conquest. This is due in part to the fact that the “molecular clock” used by scientists to date the appearance of genetic markers is not always accurate enough to pinpoint the timing of migrations that occurred as recently as a few hundred or even a few thousand years ago. The LDS.org essay here does not specify what the supposed “Near Eastern DNA markers” are, nor does it provide any citation to support this statement. The only “DNA marker” found in Native American DNA that has ever been touted as Near Eastern is haplogroup X, which has been found in Native Americans North America especially in the northeast and not at all in Central America or South America.5 Ugo Perego, the LDS geneticist on whose work the LDS.org essay is heavily dependent, himself made this point in at least one study in which he was the lead scientist.6 This distribution of haplogroup X is a fatal blow to viewing that haplogroup as evidence of Israelite occupation in ancient Mesoamerica, the view favored by all of the Mormons cited in the LDS.org essay. Moreover, as Perego explained in the same article, haplogroup X was part of the genetic makeup of the initial populations that migrated into the Americas roughly 14,000 to 17,000 years ago,7 obviously far too early to have any bearing whatsoever on the question of people of Near Eastern descent arriving in the Americas 2,600 years ago.8 The “molecular clock” is really a non-issue, since scientists have refined their methods (as the LDS.org essay acknowledges in a footnote) and since they have studied remains of Native American individuals that can be dated using other methods. Scientists do not rule out the possibility of additional, small-scale migrations to the Americas. The footnote to this sentence cites a scientific periodical article to which Ugo Perego, who probably contributed heavily to a draft of the LDS.org essay, is listed second as one of the major authors of the study. And what the above sentence says is true and agrees with Perego’s study, in which he and his co-authors suggested the possibility of a more complex story of migrations to the Americas. Of course, the point of the sentence in the context of the LDS.org essay is obviously to suggest that if scientists cannot rule out the possibility of some small-scale migrations to the Americas, then they cannot rule out migrations of Israelites to the Americas in the sixth century BC. However, Perego’s scientific study simply cannot be used, even by Perego himself, to support such an argument. The study by Alessandro Achilli, Uro Perego, and other scientists, was a contribution to an ongoing discussion among scientists about the adequacy of different models of the migration of people from Asia to the Americas. As they state toward the beginning of the article, “One very contentious issue is whether the settlement occurred by means of a single or multiple streams of migration.”9 Scientists had originally proposed a simple model of one massive migration across Beringia (where the Bering Strait is now) from Siberia into Alaska, from which the migrating people spread throughout the Americas. More recently two or even three major migrations have been proposed to account for diverse groups of Native American peoples. And here is the crucial point: the theory was that the genetic data was best explained by “a minimum of three distinct streams of gene flow from Beringian/Siberian sources.”10 The article holds out no possible support for the notion of gene flow from Israelites sailing across the Indian and Pacific Oceans in the first millennium BC. What this means is that the particular genetic marker called B2, part of the mitochondrial (mtDNA), or maternal, DNA, might have entered North America by passing through Beringia and Alaska, across part of Canada, and then moving southward through a “corridor” that was relatively free of glacial ice down the middle of the continent. That is the hypothesis that the study concludes “cannot be completely ruled out” even though at this point it also cannot be substantiated. Here again, the study is not suggesting the possibility of additional migrations from entirely different quarters arriving through completely different routes than the Siberia-to-Alaska route that the article affirms, along with the consensus of scientists. What they are concluding is that even a three-migration model may be too simplistic; there might have been additional incursions from Asia into the Americas at other times, as well as other events and processes internal to the Americas that contributed to the genetic history of Native American peoples. There is nothing here to encourage the idea that Israelites made transoceanic journeys to the Americas and became a significant part of the genetic history of the indigenous peoples who were here when the Europeans arrived in the fifteenth and sixteenth centuries. Genetic drift is the gradual loss of genetic markers in small populations due to random events…. A study in Iceland combining both genetic and genealogical data demonstrates that the majority of people living in that country today inherited mitochondrial DNA from just a small percentage of the people who lived there only 300 years ago. The mitochondrial DNA of the majority of Icelanders living at that time simply did not survive the random effects of drift. It is conceivable that much of the DNA of Book of Mormon peoples did not survive for the same reason. Genetic profiles may be entirely lost, and combinations that once existed may become so diluted that they are difficult to detect. Thus, portions of a population may in fact be related genealogically to an individual or group but not have DNA that can be identified as belonging to those ancestors. In other words, Native Americans whose ancestors include Book of Mormon peoples may not be able to confirm that relationship using their DNA. It should be obvious that the reason the authors of the study can state confidently that these factors resulted in the loss of haplotypes is that it is possible to study the haplotypes of ancient people directly (by performing genetic analysis of their remains) and then to compare them with the haplotypes of their modern counterparts. Thus, even if, hypothetically, all modern-day Native Americans had lost their Israelite genetic markers through genetic drift or other factors, scientists can and have studied the genetic markers of ancient Native Americans throughout the Western Hemisphere and in various eras. The evidence is now overwhelming that Middle Eastern peoples were never a significant part of the pre-Columbian populations of the Americas. If we accept the conventional scholarly LDS view of the Book of Mormon, the Lehites and Mulekites both arrived in Mesoamerica, though in different parts, around the same time in the sixth century BC. As explained earlier, the presumption should be that most or all the founders of these groups were Israelites of fairly typical Middle Eastern genetic heritage. These groups lived in the land separate from one another for about four centuries before discovering one another.19 Throughout this time, both groups, according to the conventional Mesoamerican model, were intermarrying with the local indigenous peoples and growing in numbers, and thus perpetuating their Israelite genetic markers independently of one another. Then the Nephites, a subset of the Lehite population, and the Mulekites united into one Nephite society, while the Lamanites, the other main subset of the Lehites, also continued to live nearby. The Nephites and Lamanites persisted side by side in the land for several hundred more years. Given this sort of history, it is simply implausible to suggest that genetic drift might have eliminated all traces of ancient Middle Eastern descent in the peoples of Central America. As noted toward the beginning of this article, the problem is compounded by the Book of Mormon account of the Jaredites, who were also supposed to be of Middle Eastern descent. The Book of Mormon states that all of the Jaredites except one died out before any of the Israelites arrived in the early sixth century BC. However, many Mormons, realizing that the historical evidence does not support a complete depopulating of Mesoamerica (or any other significant geographical region in the Americas) in the sixth century BC, have suggested that Jaredites mixed with other peoples after the war that destroyed their people, so that Jaredites are also among the ancestors of today’s Native American peoples. But this explanation would only make it all the more implausible to claim that Middle Eastern genetic markers would be completely lost, not only in modern Native Americans but also in the numerous remains of ancient Native Americans that have also been analyzed by geneticists. As things stand, then, DNA studies continue to pose an extremely difficult problem for belief in the historical validity of the Book of Mormon. LDS apologetics is forced to adopt strained interpretations of the Book of Mormon itself and to misrepresent in subtle ways the scientific research in order to force the two into harmony. This conclusion is not made on the basis of any lack of faith in God, but on the basis of confidence that any true revelation from God will cohere with the evidence of God’s creation. The evidence is overwhelming that the Book of Mormon does not pass this test. 1. For an earlier article discussing the scientific issues and LDS apologetic responses, see Joel B. Groat, “Lamanites No More: DNA and Lost Ties to Father Lehi” (Institute for Religious Research, 2004), especially Parts 2 and 3. 2. Ugo A. Perego, “The Book of Mormon and the Origin of Native Americans from a Maternally Inherited DNA Standpoint,” in No Weapon Shall Prosper: New Light on Sensitive Issues, edited by Robert L. Millet(Provo, UT: Religious Studies Center, Brigham Young University, 2011), 186-87 (171-217). This article originally appeared in FARMS Review 22, 1 (2010): 191-227. 3. Andrés Reséndez and Brian M. Kemp, “Genetics and the History of Latin America,” Hispanic American Historical Review 85/2 (2005): 284 (283-98). 4. Maansa Raghavan, Pontus Skoglund, Kelly E. Graf, et. al., “Upper Palaeolithic Siberian Genome Reveals Dual Ancestry of Native Americans,” Nature 505 (2 Jan. 2014): 87-91 (quoting from the abstract). 5. Beth Alison Schultz Shook and David Glenn Smith, “Using Ancient mtDNA to Reconstruct the Population History of Northeastern North America,” American Journal of Physical Anthropology 137/1 (2008): 15 (14-29). 6. Ugo A. Perego, Alessandro Achilli, Norman Angerhofer, et. al., “Distinctive Paleo-Indian Migration Routes from Beringia Marked by Two Rare MtDNA Haplogroups,” Current Biology 19/1 (2009): 4 (1–8). 8. This is why haplogroup X is also irrelevant to the Heartland and Great Lakes models of Book of Mormon geography: although the indigenous peoples in those regions did and do carry haplogroup X, they inherited it from peoples who arrived in the Americas perhaps 14,000 to 17,000 years ago. 9. Alessandro Achilli, Ugo A. Perego, Hovirag Lancioni, et. al., “Reconciling Migration Models to the Americas with the Variation of North American Native Mitogenomes,” Proceedings of the National Academy of Sciences of the USA 110/35 (Aug. 2013): 1 (original pagination 14308-13). 13. Cassandra Brooks, “First Ancient Human Sequenced,” Scientist, Feb. 10, 2010. 14. Morten Rasmussen, Yingrui Li, Stinus Lindgreen, et. al., “Ancient human genome sequence of an extinct Palaeo-Eskimo,” Nature 463 (11 Feb. 2010): 757-62 (quoting from the online version). 16. A. L. Töpf, M. T. P. Gilbert, R. C. Fleischer, and A. R. Hoelzel, “Ancient Human mtDNA Genotypes from England Reveal Lost Variation over the Last Millennium,” Biology Letters 3/5 (22 Oct. 2007): 550-53. 17. See further Simon A. Southerton, “Answers to Apologetic Claims about DNA and the Book of Mormon,” rev. ed. (Signature Books website, 2006; reprint, Institute for Religious Research), question 8, for a detailed discussion of the Iceland case. 18. Shook and Smith, “Using Ancient mtDNA to Reconstruct the Population History of Northeastern North America,” 14. 19. Garth A. Wilson, “The Mulekites,” Ensign, March 1987.